Hey son! Remember when we took that trip to Chernobyl and shot those Russkies? We make a great team! This is paraphrasing the father and son schmaltz that cripples the fifth Die Hard movie, an entry so poor that after twenty-five years it puts a once thrilling series on life-support. It's impossible to comprehend how this happened. 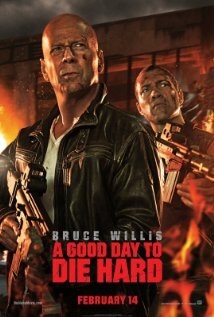 Die Hard 4.0 was the highest grossing entry featuring Bruce Willis' New York detective John McClane. It was smart, physical, and even politically self-aware. The terrorist threat was from within: one of the US government's own men gone rogue. But someone must have felt it took too many jabs at the Bush administration and FEMA because A Good Day is by contrast embarrassingly archaic in its geocentric worldviews, and pro-American values. Similarly, film critic Paul Byrnes compared the series to the John Wayne movies of old, with a modern cowboy in McClane out to defend the wealth of the American homeland. But I don't believe the series has strayed into jingoism before as overtly as it does here. 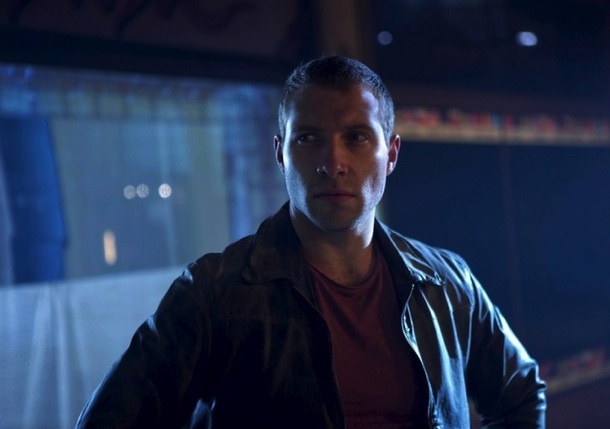 This is the first movie set outside the US and John and his grownup son Jack (Australian Jai Courtney) face off against the Russians, including a father and his own child. Guess who comes out on top and learns they love spending time together killing Reds? The bonding through murder is outright offensive. John and Jack comfortably mow down hordes of evil Russians but afterwards talk about why Jack doesn't call him dad anymore. Some of this cringing banter isn't meant to be funny so there's no irony or logic in how these characters behave. Why the filmmakers also felt the Cold War tensions had any contemporary relevancy we will never know. Ironically, it takes a villain to announce: "Reagan is dead". It's the most authentic line in the movie. 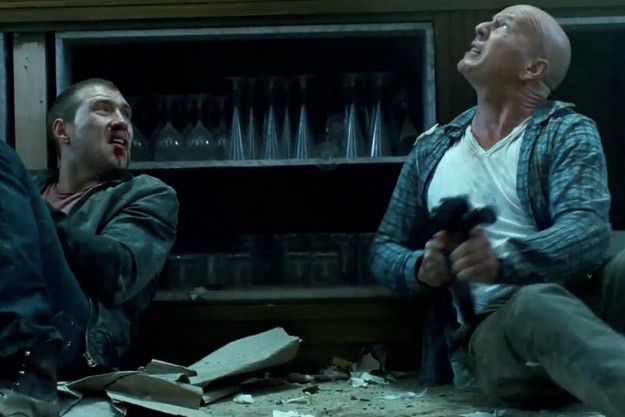 Director John Moore's last film four years ago was the dire Max Payne. He's made a hash of this movie too, treating it every bit like a video game. The film runs thirty minutes shorter than the other films and it's by far the thinnest in the series. 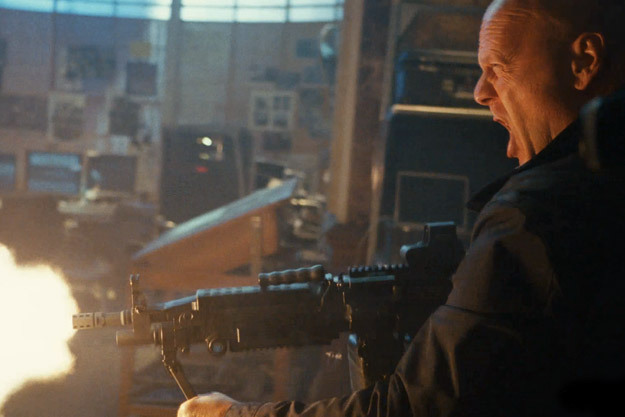 The action sequences, overcut and edited, have been stretched to excruciating lengths, as though the filmmakers thought we couldn't handle a moment of plotting. There is no narrative structure to speak of, or any backstory, only lazy exposition to create tenuous links between each setpiece and stunt. The action itself is laughable. 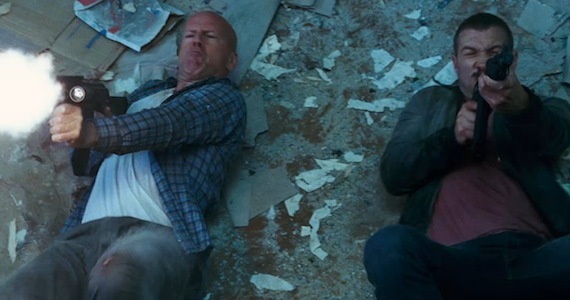 Remember the iconic scene where McClane picked broken glass out of his feet? He's more like a ragdoll or a comic book character now. He seems immune to glass, capable of jumping through windows unharmed. He's also fireproof, surviving an exploding room, with flames edging so close they could singe the top of his head, and shock absorbent, walking away from two violent car crashes. Where is the tension if the main characters are immune to everything thrown at them? The miniscule plot runs accordingly: Russian prisoner Yuri (Sebastian Koch) is incriminated by corrupt politician Viktor Chagarin (Sergei Kolesnikov) and is set to be tried in Moscow. 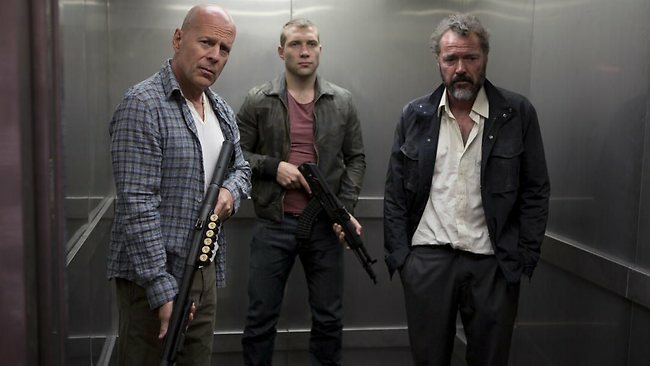 Meanwhile, McClane's son Jack, who has been in the CIA for three years, is also arrested for an attempted assassination. John learns that his son is in trouble and travels to Russia to find him. An explosion is triggered around the courthouse and Jack helps Yuri escape. Meeting up with John, they hurry to find a file that could lead to Viktor's downfall. The opening of the film feels the steadiest but is still extremely incoherent. How exactly did Jack join the CIA and who was he trying to assassinate? Once John finds his son the wheels come off badly. There's no humanity or feeling provided by either Willis or newcomer Courtney. They're treated like tokens, trapped in a video game that is posturing as a movie. The longer this goes on the worse it gets.